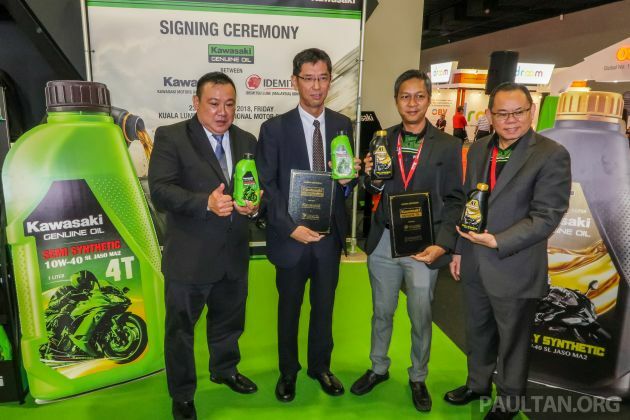 In a first for the Shah Alam, Selangor, based company, Kawasaki Motors Malaysia has launched a range of motorcycle lubricants to the local market with collaboration from Idemistu Japan. With its wide ranging experience in the industry along with technological expertise and strict quality control are among the reasons Kawasaki Malaysia has chosen to parter with Idemitsu. The new Kawasaki lubricant is separated into two types for four-stroke motorcycles but possess the same grade – Semi-synthetic 10W40 and Fully Synthetic 10W40. Kawasaki motorcycle lubricants can be found in all Kawasaki GT World, Ninja Shop and Green Station outlets and is priced, per litre bottle, at RM29.90 for semi-synthetic and RM39.90 for fully synthetic. Kawasaki claims the formulation in its lubricants helps improve engine fuel efficiency, gearbox shifting action and extending wet clutch performance in all Kawasaki motorcycles. Aside from that, Kawasaki lubricants are formulated for reducing engine wear during cold engine starts. Is there any difference from the Normal Car Semi and Fully synthetic CAR Motor Oil ? Obviously Kawasaki/Yahama and Honda would say M.Cycle Motor Oil is different from CARS !!! Motorcycles share oil between engine and gearbox, while cars completely separate both systems. Motorcycle oil has extra addictives that let the clutch pack work. Lain. Motorcycle got higher RPM. Kereta much lower. Now is year 2019,why they still using SL grade oil?